The traditional word of mouth is no longer enough in the digital age . Getting more customers in your business and making it successful requires a lot more in online and social marketing . The staggering amount of people that have social media accounts and use these platforms to explore , search and tag can be a very potent tool for a successful business . 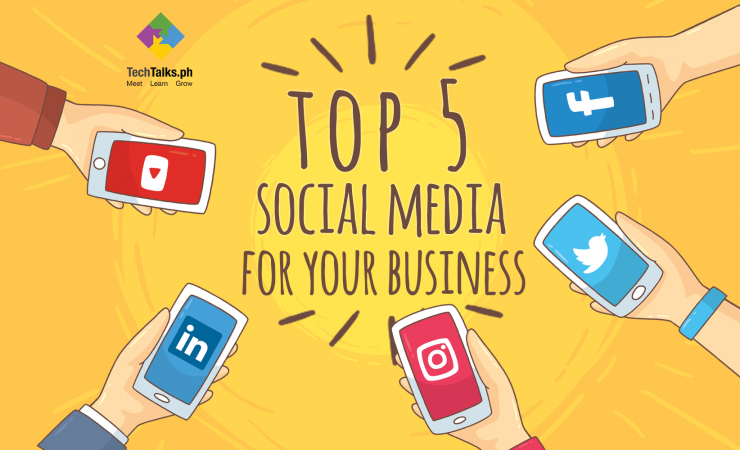 Listed below are the 5 social media channels your business should have . The tricky part is the time and effort to these social media accounts but if you do it right then your business would surely be on the radar since most social media users are growing expeditiously every single day. 1 . FACEBOOK would be the number one choice of businesses since it's the most popular social media worldwide with billions of active users . Facebook is really a strong channel for businesses especially when one can use this media channel to gather news , run effective online ads , manage and join communities and post different content for your followers ,create competitions and integrate applications . 2 . TWITTER is a strong social media channel but comparing Facebook to Twitter is like comparing an apple to an orange . Twitter has a different clothing and it is very useful for your customer service desk . Twitter has already proven its power all these years and has been a dynamic source for brands to be successful since Twitter community is more straightforward and personal . Google and Twitter has been good friends for so long meaning your Twitter page will most likely to appear at the top of the search results increasing your chances to be seen and discovered. 3 . INSTAGRAM offers different landscape for users . This platform focuses on visual content . This is an exceptional way for businesses to thrive on this community since Instagram is less hodgepodge and more into visual strength and branding styles . Instagram has a whopping 150 million users and gaining followers wouldn't be so hard once the branding style and visual content are evident and mastered. 4 . LINKEDIN is all about professionalism . If you have a product to launch then this social media platform is right for you . Based on the recent numbers , B2B businesses thrive in Linkedin and use it more as a hub for product launch and introduction . This channel can also recruit , and look for talents and networks and group where one can increase its network and create a brand name and visibility. 5 . YOUTUBE is a powerful avenue for businesses who want to reach the customers through an engaging video content and entertaining viral video . Youtube offers free video hosting meaning one can upload business videos any time and embed it in their website or social media . Millennials and the youths now are eating videos for breakfast and Youtube has the ability to reach millions of people so creating Youtube videos is a good chance to build brand loyalty online and sharing corporate videos leads to showcasing the business ' culture and branding . Customers are very loyal to brands that reflects their values and sense of personality . Successful businesses that have found their niche online are now already harvesting the fruits of their labor mastering the art of social media. With social media’s ever growing community of online users, businesses can immediately find their market. That is why practicing those camera angles and video editing skills will definitely have its rewards soon. Is your brand on the right social media channel? Which channel did you find more helpful?